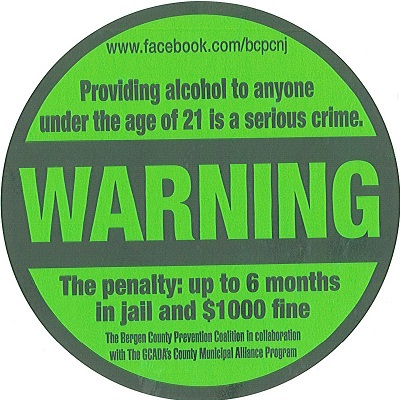 The Sticker Shock campaign is an initiative of the Bergen County Prevention Coalition. Sticker Shock brings awareness towards underage drinking, one of the four priorities of the BCPC. The stickers and hangers placed on the products throughout the store act as “warning” labels to inform the public of the consequences they can face if they provide or purchase alcohol for minors. The message comes in loud and clear when minors are the ones spreading the word and taking action. Parents, older siblings, older friends, etc. are often unaware that they themselves can get into trouble along with the individual that is not of age. Underage drinking is a serious issue and can be harmful to the individual. The municipalities that have participated in the Campaign are: Bergenfield, Bogota, Fairview, Franklin Lakes, Garfield, Hackensack, Hasbrouck Heights, Leonia, Oakland, Paramus, Ramsey, River Vale, and Waldwick.